When you find yourself facing a snake, his flicking tongue makes him look ominous, as if he's trying to see if you'd make a tasty snack. That could be exactly what he's doing, as snakes use their tongues to smell more than they use their noses. It doesn't mean he's about to lunge, only that he's trying to get a better feel of whether you smell dangerous. When a snake flicks his tongue in and out rapidly, he's smelling for something. He might be in search of prey, seeking a mate or making sure the coast is clear of danger. A snake has nostrils and a limited amount of smelling ability through them, but that's not his main method of gathering scents. Scent particles stick to his tongue, and he interprets these smells as he draws his tongue back inside his mouth. The more times he sticks out his tongue, the more scents he picks up. A snake tongue works in conjunction with a Jacobson's organ, located in the top of his mouth just behind his front gums. 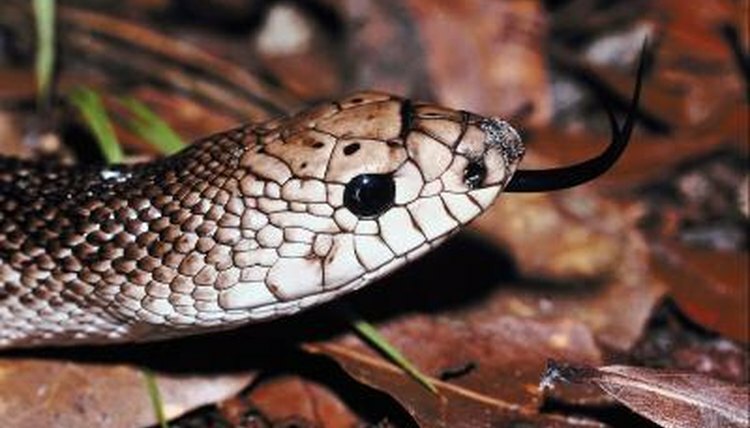 Several animal species use this type of organ to distinguish smells, but snakes tend to flick their tongues to and from the organ quickly, unlike most other animals. This organ helps interpret the smells, sending signals to the snake's brain so the snake can act immediately on the scents; his reaction might be to strike immediately or run away from a potential threat, for example. The forked tongue of a snake gives him a sinister appearance, but the fork isn't designed to instill fear in all who see it. Instead, it gives the snake a bit of an edge as he's trying to track down food or a mate. When he brings his tongue back inside his mouth to the Jacobson's organ, he slides it into two little slots, where the forks fit perfectly. This helps him determine a smell's direction as well as whether it's something worth investigating. The left and right fork might bring in different smells, or different levels of the same smell, helping the snake figure out which direction it's coming from. When a male snake finds a female snake he's interested in, he uses his tongue to confirm she's the right species for him. Then, he begins a courtship dance that includes rapid tongue flicking. A female snake often chooses a mate based on this dance; if she likes his body and tongue movements, she might decide to mate with him. Otherwise, she's likely to slither away. PetMD: Why Do Snakes Use Their Tongue?